Loving heavenly Father I am coming to you of behalf of so many of my brothers and sisters in Christ that are suffering with cancer. Lord I place each one into Your loving care and pray that in Your grace You will comfort their heart and sooth away all anxieties. Strengthen each one as they face the future which will be fraught with difficulties. Give them the peace that only comes from You and I pray that You will uphold each one with the strength of Your mighty arm. Give those that are treating and caring for these dear children of Yours, the skill and wisdom to do what is best in dealing with this destructive illness. Dear God, I know a number of people I care about who are suffering with cancer and I am frightened about getting cancer myself. I am coming to You to ask that You keep me from getting any type of cancer in my body. Dear Lord Jesus, You have called us to come to You when we are in trouble or heavy laden and You will give us rest, hope and comfort. I come to You today, knowing that I have a been diagnosed with cancer that is so far advanced that I have been given but a short time to live. Lord this is a shock and yet I want to trust You through it – give me the courage I pray. Give me the strength and courage to leave this evil cancer in Your hands, knowing that You have scheduled every day of my life and this is no surprise to You. Be with my dear family at this as I know that their hope seems to be shattered and are in deep distress. I ask Lord that through my illness You will draw each of them that I love into a saving faith and full fellowship with Yourself. I pray that You would heal me – but whether I live or die, I lay my life into Your strong hands, and thank You that I am Your child. Thank You that I can come to You and there find rest for my soul. Dear God I have been diagnosed with a destructive cancer that is eating away at the body that You have given me. Help me to be strong and courageous as I face this big health problem in my life. I did not expect to be one that would suffer form cancer – but I pray that You will give me the strength and courage to face whatever may come my way. Lord, You have promised to be with me in all things and to never leave me nor forsake me and I am putting my trust in You now and pray that You will use this evil in my life to some good. Keep me under the shadow of Your wing and hold me close all the days of my life until I come to be with You in my heavenly home. Please say a prayer from my friend Gino Manna and his family. Gino is suffering from stage IV pancreatic cancer that has spread to his liver. He is in pain and is about to undergo a round of powerful chemo for pallative means to hopefully extend his life so that he is able to stay with his family a little while longer. I believe that God has the power to heal and deliver miracles and this is a family that has been through a lot a truly needs one. Gino's 18 year old son is just healing from his own surgery that removed a cancerous tumor on his thigh last spring, and he's not even out of the woods totally himself. Please Lord, have mercy on this wonderful family and grant them your peace. Please pray for Tom to be healed of pancreatic cancer. Lord, I need your covering tomorrow during breast surgery to remove cancerous tissue. Lord, help the surgery get clear margins around the tissue so that no further surgery will be needed. Cover me so that I will be safe through anesthesia and lymph node surgery. I TRUST IN YOU LORD AND HAVE FAITH IN YOUR HEALING POWER. IN JESUS NAME I PRAY. Oh God please heal my father from his stage 4 cancer. We surrender everything to you! We declare your holiness , we confess healing upon my father we Claim his quick recovery upon your name Jesus. Give him strength to overcome physical and mental problems. Lordnothing is impossible to you and we declare it in your name Jesus. God thank you! We pray this in your name Amen! Dear Lord I pray for grandpa, richard, who has terminal colon cancer and has been told has 2 weeks to live. I lift him to you, comfort him, strengthen him, and be with him Lord. Heavenly Father I ask you to please send forth your healing power through my body to please heal my breast cancer and melt with the heat of Your healing love and to please arrest the further spreading of those sick cells and please create in me a new and healthy cells. 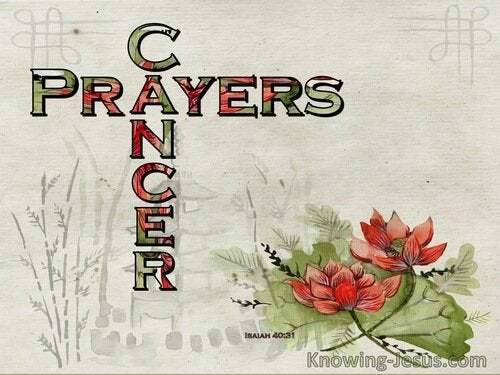 Dear God, help my body with my cancer that is killing my body. I need your love and help so I can be with my family. I need to be strong to keep my marriage, I am taking care of two grandchildren that needs me until they are done with school. I want to live so I can enjoy and be with my family. Please have mercy on me.